Animal tissues. Muscle. Atlas of Plant and Animal Histology. Muscle tissue drives the body and organs movement. Muscle cells are known as myocytes or muscle fibers. They have the ability to decrease their length, which in turn produces muscle contraction. The contractile capacity depends on the association of actin filaments and myosin II motor protein filaments in the cytoplasm. Muscle cells are divided into three types: skeletal, smooth and cardiac. Skeletal muscle cells are very long cells that show dark striations, which are perpendicular to the cell longitudinal axis when observed at light microscopy, hence they are also referred as striated skeletal muscle cells. Although cardiac muscle cells, or cardiomyocytes, also show striations, they are regarded as semi-striated. These dark transverse lines do not appear in smooth muscle cells. Striated skeletal muscle cells of the upper part of the mouse esophagus. Striated skeletal muscle is also referred as voluntary because it is responsible for conscious or voluntary movements. It is innervated by nerve fibers coming from the central nervous system. Striated skeletal muscle is usually attached to bones through tendons, but not always, like the muscles of the eye, upper esophagus and tongue. Skeletal muscles is made up of striated muscle cells, also known as muscle fibers or myocytes, as well as connective tissue, nerves and blood vessels. Striated skeletal muscle cells join together to form muscle fascicles, and muscle fascicles form the skeletal muscle, main responsible for the movements of the animals. Muscle cells are wrapped by a special extracellular matrix known as basal lamina, plus reticular and collagen fibers that together form the endomysium. 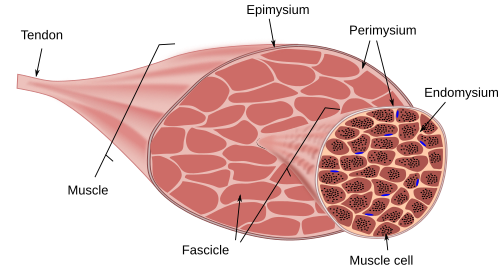 Each fascicle is surrounded by a layer of connective tissue referred as perimysium, and the whole muscle is covered by the epimysium, which is also connective tissue. Blood vessels and nerve fibers enter in the muscle through these connective tissue layers. Nerve fibers rule the muscle contractions. Organization of the striated skeletal muscle. A s mentioned above, muscles non connected to bones, at least not connected through tendons, show different organization, and are attached to connective tissue of structures such as eyes, tongue and esophagus. Striated skeletal muscle cells are very long and unbranched cells, parallel arranged in sheets and fascicles. They may range from a few µm to 30 cm in length, and about 10 to 100 µm in diameter. They have many nuclei (syncytium: a cytoplasm shared by two or more nuclei) located near the plasma membrane. The striations are a consequence of the disposition of actin and myosin filaments in the cytoplasm, together known as myofibrills. These filaments are oriented parallel to the long axis of the cell. The overlapping of actin and myosin filaments results in dark bands, and clear bands only correspond to actin filaments. Although skeletal striated muscle cells can increase and decrease their size (hypertrophy), they can not divide. During postnatal life, repairing and growth of muscles, that is the increase in the number of cells or hyperplasia, are a consequence of the proliferative activity of satellite cells. These are skeletal muscle stem cells located between the cell membrane of the mature muscle cells and the basal lamina, contains one nucleus, and can divide to give new striated skeletal muscle cells with contractile capacity. Striated skeletal muscle cells are under the control of neurons (motoneurons) located in the encephalon and in the spinal cord. It produces voluntary movements. Each motoneuron can innervate several muscle cells. Motor unit is the group of muscle cells innervated by the axon of a motoneuron. Motor units can be large, more than 100 muscle cells innervated by the same axon, or as small as a few tens of muscle cells. The number of neurons of the motor units depends on the accuracy of the movement that each part of the body needs. More precision means smaller units. Furthermore, there are two types of muscle cells regarding the contraction speed. Fast twitch muscle cells are smaller and darker, with a higher concentration of myoglobin and more mitochondria. Slow twitch muscle cells are larger and more clear, and contain less density of mitochondria. The slow twitch muscle cells are active during long lasting movements and for maintaining the body posture, whereas the fast twitch muscle cells are recruited during short and intense movements. Both types of muscle cells are found in almost every skeletal muscle of the body although with different proportions. Cardiac muscle cells of mouse heart. Cardiac muscle or myocardium is the main element of the heart walls. Its function is to pump the blood through the arteries by contracting the heart ventricle walls. Cardiac muscle is made up of cardiomyocytes. These muscle cells show only one nucleus located in a central position, are shorter (about 80 µm) and wider (about 15 µm) than the skeletal muscle cells, and are branched cells. Cardiomyocytes also show transversal striations with a similar pattern to that of the skeletal muscle cells, with dark strips corresponding to the overlapping of actin and myosin filaments, and light strips being only actin filaments. Cell membrane of striated muscle cells, both cardiac and skeletal, is known as sarcolemma. The sarcolemma of cardiomyocytes show many invaginations to form the so-called transverse tubules that have a diameter of 5 to 20 nm. Cardiomyocytes are attached between each other by the intercalated discs, which can be observed as dark bands in histological stainings. Intercalated discs are made up of many cell adhesion complexes gathered together, such as desmosomes and adherent adhesions. There are tight junctions as well, although located at the borders of the intercalated discs. The role of all these cell adhesion complexes is to keep cardiomyocytes tightly attached between each other and being the anchoring sites for cardiomyocyte cytoskeleton. There are also gap junctions between adjoining cardiomyocytes responsible for the synchronization of the heart wall contraction by allowing a direct communication of the cardiomyocyte cytoplasms. All cardiomyocytes of the same heart ventricle must be contracted at the same time to pump the blood. Cardiac muscle is not attached to tendons. The rhythm of heart beating is under the control of the autonomic nervous system that adjusts the frequency and intensity of the cardiac muscle contractions. However, the rhythmic activity is generated by some special cardiomyocytes that work as pacemakers. That is why the cardiac muscle is regarded as a muscle with involuntary contraction. The gap junctions between adjoining muscle cells help in the synchronization of the contractions by directly connecting their cytoplasms. Because of this, there is no need for nervous innervation of every cardiomyocyte, but just the pacemaker cardiomyocytes. The heart beating frequency is also influenced by hormones. Cardiomyocytes contain small amounts of glycogen, so they cannot get much energy from glycolysis. Most of the energy comes from oxidative phosphorylation at mitochondria, which means a very high demand of oxygen. Thus, when there is a cut of the oxygen supply by blood vessel obstruction, cardiomyocytes are quickly damaged. Smooth muscle cells of the mouse intestine. The smooth muscle is also known as involuntary muscle. It is found in those body organs that do not need voluntary movements such as digestive tract, respiratory system, some glands, gall bladder, urinary bladder, blood and lymphatic vessels, etcetera. Smooth muscle cells are 20 to 500 µm in length and 8 to 10 µm in diameter. In the uterine miometrium they can be as long as 800 µm in length. They are fusiform cells, sometimes with branched ends, and contain one nucleus located in the center of the cell, when they are not stretched. At both poles of the nucleus, there are cytoplasm regions containing most of the cell organelles and some cytoskeleton filaments. The rest of the cytoplasm looks homogeneous and contains the contractile system. Unlike the cardiac and skeletal muscle, smooth muscle cells do not organize the actin and myosin filaments in a regular manner, so that there are no striations when observed at light microscopy. The name smooth muscle is because these cells do not show striations. Smooth muscle cells are wrapped by a layer of extracellular matrix known as basal lamina. There are some parts between smooth muscle cells without basal lamina that allow direct contact between neighboring cells where gap junctions are established. In some epithelia, between the cells and the basal lamina, there is a type of cell, known as myoepithelia cell, with contractile capacity that help with the release of products synthesized by glands such as salivary, mammary, lachrymal and sweet glands. These contractile cells are similar to smooth muscle cells. That is why they are mentioned here. However, myoepithelial cells derive from the ectoderm and the muscle cells develop from mesoderm. Transmission electron microscopy image of smooth muscle cells of the intestine in transverse view. In this electron microscopy figure, condensed groups of proteins are observed in the cytoplasm (indicated with blue lines). They are known as dense bodies, which contain mainly alpha-actin and are attachment points for actin filaments. The dense bodies function is similar to Z discs of skeletal striated muscle. There are dense structures in the cell membrane as well, where cytoskeleton filaments are attached (encircled in red). The smaller dark points in the cytoplasm (indicated with green lines) correspond to myosin filaments in transversal view. There are scattered actin filaments (not observed in these figure), that together with myosin filaments produce cell contraction. There are around 15 actin filaments per one myosin filament (in the striated skeletal muscle the ratio is 6 to 1). In the smooth muscle cytoplasm there are also intermediate filaments like desmin and vimentin. In general, smooth muscle has half of the protein content than skeletal striated muscle, being the concentration of myosin protein particularly lower. However, the concentration of actin and tropomyosin is similar in both types of muscle cells. In the smooth muscle cells, the myosin has to be phosphorylated to activate the actin filaments, so that the contraction speed is slower. Smooth muscle cells do not contain troponin. Smooth muscle is found in many places of the body, where the smooth muscle cells are organized in different ways. Thus, smooth muscle cells may be found scattered in the connective tissue, as thin bundles in the dermis, attached to the hair follicles, or arranged in layers in the digestive ducts. 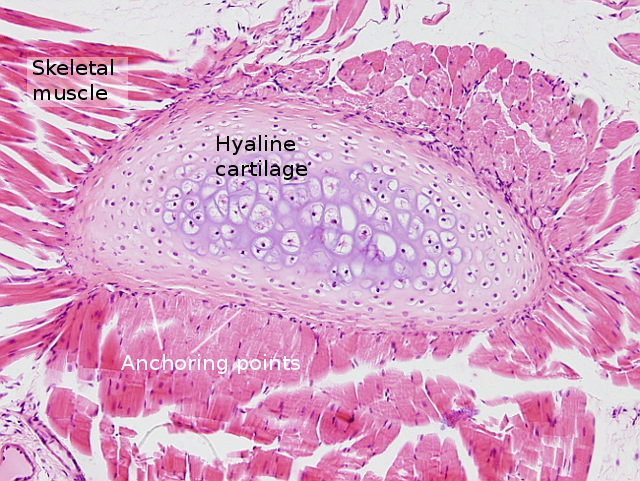 The role of smooth muscle in the hollow organs is double: tonic contraction to keep the dimensions of the organ against potentially harmful distensions and carry out the function of a particular organ such as peristaltic movements of the gut and regulation of the blood pressure in cardiovascular system. Smooth muscle cell contraction is triggered by the axons of the autonomic nervous system. 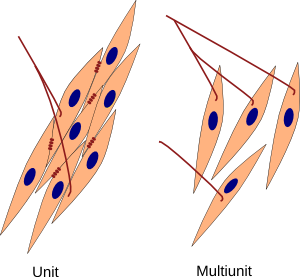 Functionally, smooth muscle cells are organized in two ways: single units and multiunits. In single units, smooth muscle cells are arranged in layers so that the ends of the cells are imbricated among of the middle parts of the surrounding cells. In this way, cell membranes of neighbour cells are very close and can form gap junctions, so that nerve fibers only make contact with a few cells and the cytoplasm-cytoplasm direct communication synchronizes the contraction of the group of connected cells that form the unit. In the multiunit organization each cell is independently innervated and isolated from the others by connective tissue. The depolarization of the membrane potential that triggers the cell contraction may be produced by axonal innervation, by autocrine and paracrine chemical signaling, and by mechanosensory receptors located in the cell membrane of the smooth muscle cells that are able to detect the stretching of the cell. Smooth muscle can produce contraction forces as strong as the skeletal muscle, however the speed of the contraction is much slower. Organization of the smooth muscle cells in single units and in multi units. The brown lines between cells depict gap junctions.